284. Represents a feeding apparatus for the bed of a sawing machine. By the revolution of the crank at the lower part of the figure, alternate motion is communicated to the horizontal arm of the bell crank lever whose fulcrum is at a, near the top left-hand corner of the figure. 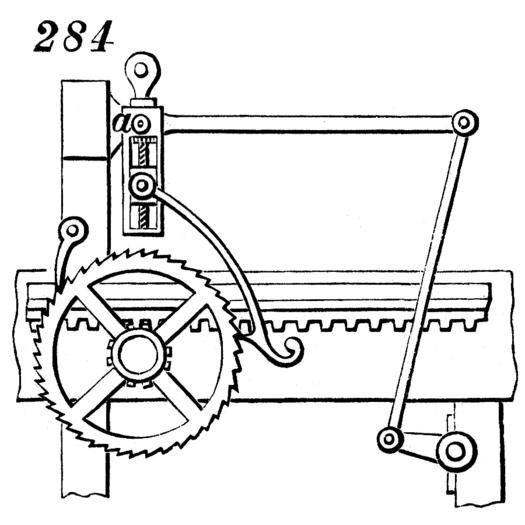 By this means motion is communicated to the catch attached to the vertical arm of the lever, and the said catch communicates motion to the ratchet-wheel, upon the shaft of which is a toothed pinion, working in the rack attached to the side of the carriage. The feed is varied by a screw in the bell-crank lever.